By all accounts, this really shouldn’t have happened. I mean, c’mon. 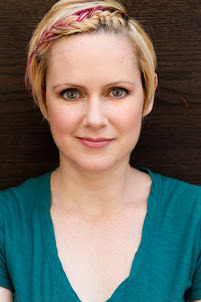 I specialize in contemporary storytelling, favoring the intimacy of on-camera work and small, relationship based musicals and plays. So, though I’ve been trained in the classics (and Shakespeare in particular) I have never considered spending time with Shakespeare in my professional career. I tried to get out of it, frankly. I had a long conversation with Brandon and tried to wheedle my way out. For one thing - right now, I am focusing on building my career in film, TV and musicals. My concern has been that if I take 3 months away from these things to do Shakespeare, I wouldn’t be building my career. Further, if industry people come to the show, they might have an expectation of me as a classical actress, and judge me accordingly. My fear has been that I’ll be compared to those who “do this for real” and I won’t get the kind of response I need to build on the momentum I’ve created. To this, Brandon simply said, “Ok.” So, I pulled out the big guns - my “solution” to this problem that could make everyone happy - The Seeing Place has amazing ensemble women, several of whom specialize in Shakespeare. Wouldn’t it make more sense for one of those gals to be chosen? And that’s what did it. I joined the production -- because my friend asked me to be a part of his artistic vision. Not because of something I was going to “get” out of it. Not because I would be a star, or agents would sign me, or good reviews would be written. But because Brandon reminded me that we are actors because we want to make art. Good art. Art that provokes, and in that good way that makes people think. Art that exposes - and makes audiences think they are peering in on private moments. Art that makes people debate its value. Art that allows actors to live through situations rather than just talking about them. That’s what actors are seeking. That’s what I’m seeking. And thats’ what we’re offering, starting tomorrow when we open this show. 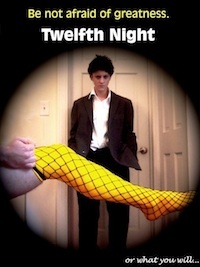 I sure hope you’ll join me -- if not for the joy of seeing an intimate, rousing, modern version of Shakespeare’s “Twelfth Night”, then do it to see me make a fool of myself on stage. Because I do it for all of you. And I do it for myself.